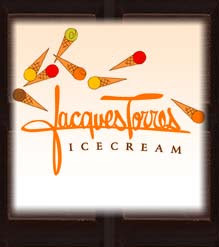 As Brooklyn increasingly becomes the go to place for food lovers, the entrance of Jacques Torres Ice Cream parlor is no exception. Homemade ice creams, sorbets, and frozen yogurts + fresh baked waffle cones = delicious treat on a hot summer day. Flavors like chocolate banana, sweet pink strawberry - and top off your treat with chocolate covered cheerios! Favorites also include ice cream sandwiches and sundaes galore. Grab a slice of pizza at Grimaldi's or chow down on one of Red Hook Lobster Pound's heavenly lobster rolls at the Brooklyn Flea and then head on over to Jacques Torres for a sweet treat.